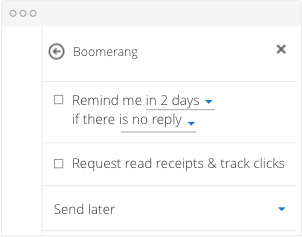 Add a reminder in Outlook to any email you need to follow-up on, using Boomerang's follow-up reminders. Adding reminders in Outlook no longer means using clunky follow-up reminder flags. Boomerang allows you to defer or "snooze" emails you send or receive to a future time, removing the message from your inbox and returning it back to the top of your inbox at the time of your choosing. Get reminded about emails the moment you need them! I love the reminders to follow-up and meeting time suggestions in Boomerang for Outlook and Office 365. Avoid forgetting to follow-up on an email you can't respond to right away. Get reminded only if the email doesn't get a reply. Dismiss a message until the time it is needed, reducing email and reminder flags cluttering your inbox. Add a reminder to any Outlook email using Boomerang! There are times when you need to follow-up within a given period of time after sending a message. Using Boomerang's follow-up reminder feature, you can choose to be reminded only if nobody replies (or regardless of replies). This way you won't let messages slip through the cracks and will never forget to follow-up on important emails. You can get use Boomerang reminders with any email in your mailbox, not just those you compose, whether on Outlook.com, Outlook on the Web, Outlook 2013, or Outlook 2016! Thanks to Boomerang's Office ribbon integration, you can get a reminder on any email without needing to leave your Outlook inbox. It's just as if Boomerang was a native part of the Outlook experience.